But what are rules for if not to be broken? This was not an opportunity I was prepared to miss. 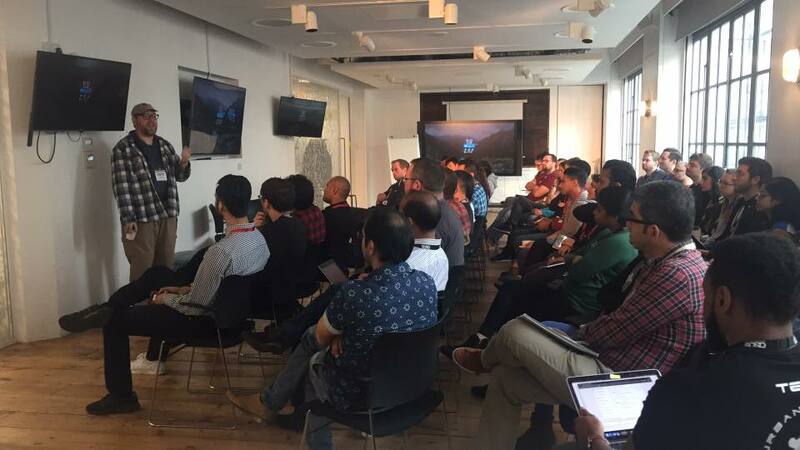 Like an excited schoolboy writing fan-mail to his favourite football player, I reached out to James inviting him to visit our London offices to meet with our software testing community. After a nervous few hours wait, he finally responded and accepted the invitation. I couldn’t believe it. The James Bach was coming to speak at my office and what’s more, he wasn’t even expecting to be paid for his time… as long as we kept him well supplied with coffee to suppress the jet-lag. Two weeks later James arrived at our offices, complete with his familiar look of plaid shirt, baseball cap and beard. After a brief introduction and stop off at the coffee stall I walked James into the conference room and introduced him to the crowd. Without hesitation James then proceeded to field questions from the room and engaged in a lively and at times humorous discussion about all things software testing. For two hours he continued telling stories, imparting nuggets of wisdom and posing thought-provoking questions. I was stunned. I’ve been to many conferences and watched countless keynote speeches but never have I witnessed someone walk up on stage in-front of a group of complete strangers – without any preparation or rehearsal – and speak at length about such a wide array of topics with such eloquence and ease. Needless to say, I no longer listen to people who tell me not to meet my heroes. Next up, beers with Alan Shearer!